Padmé Amidala and Leia Organa are icons in discussions about female characters in science fiction. Panelists will delve into the representations of females in the Expanded Universe and the recurring theme of the Jedi Princess. As a counterbalance, the Sith witches transcend the stereotypical caricatures often found in fairy tales and the “ordinary” female characters such as bounty hunters, intelligence agents, smugglers, and fighter pilots that capture our imagination without mystical powers. Star Wars is amazing because it draws equal numbers of female and male fans. Why is that? Is it because of the strong female characters in the show? Come to this panel to engage in this conversation. This is great timing, as we announced last Monday that Ashley Eckstein will be attending our convention as a guest. She will be joining this amazing panel. We were able to snag Tricia Barr, moderator of the panel and creator of the FANgirl Blog. Tricia shared some additional details about the panel and talked about what parts of GeekGirlCon ’12 have her excited. Read on! 1. How long have you been a Star Wars fan (and how did you become one)? 2. How did you select the women for your panel? Star Wars crosses divides. Boys like it; girls like it. There are gamers, books readers, and comics aficionados. Fans come in all sizes too – kids, young people, and adults like myself, many of them with children who are becoming the next generation of fans. I really wanted to represent all types of fans and to be able to spotlight fans who are working to promote women and strong female characters. Having GeekGirlCon ‘12 nestled between San Diego Comic-Con and Star Wars Celebration, plus a few strokes of bad luck, made the process challenging. I’m so happy to have ended up with a great cross-section of fans. I think the Force was with the panel in the end. 3. What sort of themes or messages are you hoping to discuss? Before we can talk about strong female characters – whether that means heroines, villainesses, or the shades of morality in between – we have to tackle the subject of what the word “strong” means. Does it mean a hulking powerful character? What about emotional fortitude? Can strength be a weakness? There is a common misperception that when fans say “I’d like more strong female characters” they mean they don’t want their female characters to be flawed or to have weaknesses. So I think it’s important to discuss that first. Beyond that, we have the different types of female characters found in Star Wars. The first Star Wars movie was built on the framework of Joseph Campbell’s hero’s journey, yet it began the evolution toward modern myth by tweaking a few of the “rules.” The best example is the princess and woman-as-temptress trope, where Star Wars diverged from storytelling norms with the introduction of Leia as a fierce warrior and leader. 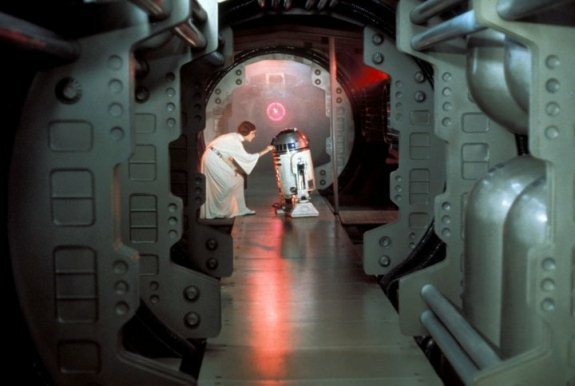 While A New Hope had a comic book style story to it, when Irvin Kershner came on board to direct The Empire Strikes Back he relied heavily on the storytelling elements of the classic fairy tale. The Original Trilogy built the backbone of Star Wars and definitely helped introduce a new type of female character to the world. Female characters of Star Wars is a broad topic, so in framing the panel I used the fairy tale elements like the Jedi princess and Sith witch to focus the discussion. These types of characters exist in the movies, videogames, The Clone Wars television show, and the books and comics. I also want to have the panelists share their thoughts on the female characters that fall outside of the archetypes, which are usually the characters people often identify with. These are the Everywoman – like mercenaries, X-wing pilots, smugglers, intelligence operatives, and politicians. There are some good examples of the Everywoman characters written well, and it’s important to highlight them and also talk about where the Galaxy Far Far Away can improve. 4. In looking over our programming, are there any events/panels you are super excited about? Wow! That’s a big question. I’ve been looking over the program for a couple days now trying to narrow down the possibilities. There are just so many fantastic panels to choose from. I’m a professional engineer, and it isn’t always easy for young women in STEM careers, so I want to see at least a couple of the panels on those topics. As a college intern I worked on the Space Shuttle program, so the NASA panel is a must see for me. There are also a couple of panels on characters with disabilities. I’ve always believed good characters have to overcome challenges – sometimes they are mental or emotional, but they can also be physical barriers. I incorporated physically disabled characters in my fanfiction and have an important character mapped out in my upcoming original fiction novels who has a disability. I’m hoping to get some great insight on this topic. As I’m finishing up my own novel Wynde, almost every panel on publishing becomes a must see – the Womanthology panel and So You Want To Write (And Finish) a Novel? are ones that caught my eye. Definitely, I want to listen to Greg Rucka and Gail Simone talk. Who doesn’t? The panel highlighting Geek Girls in Pop Culture and panels discussing misogyny in geek culture and how to deal with it also interest me. We have to keep talking about the challenges women face and to give them ideas and support on how to handle those types of situations. My friend Racheal Ambrose, who died this past month and would have been making her first trip to GeekGirlCon ‘12, had used her website to discuss misogyny in the fandom. I feel it’s important to keep supporting her efforts. 5. What other things are you “geeking out” about right now? Being a Star Wars fangirl has led to many opportunities for me this year. I now write for Suvudu.com, Random House’s science fiction and fantasy blog, and also had my first magazine article published in this month’s Star Wars Insider – an interview with Aaron Allston for his novel X-Wing: Mercy Kill. Aaron creates realistic and relatable female characters, so that was a treat for me. Add to that hosting a panel at GeekGirlCon and I’m living the geek girl dream. While I have been a voice pushing for change, I love highlighting fangirls and their importance to the geek culture, to the franchises like Star Wars, and also to society as a whole. 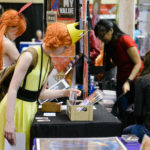 After coming to GeekGirlCon last year and picking up Jennifer Stuller’s Ink-Stained Amazons, I was inspired to start chronicling the shift I saw happening in the fandom and genre stories as they relate to female characters. She took an academic approach to identifying how external influences such as the political climate and internal forces like fandom dynamics affected stories about women. As she points out in her book, there is almost an ebb and flow in the portrayal of female characters, and I recognized that occurring within Star Wars and other genre franchises I’m interested in. We’re in a formative time right now, but there are a lot of promising signs with the success of The Hunger Games and The Legend of Korra. My inner geek has empowered me to write about the evolution of the heroine’s journey and I’m starting to get a lot of positive feedback from educators on what we’ve done to chart that at FANgirl Blog. I’m excited to meet Jennifer in person and thank her for that inspiration. Honestly, I’m totally “geeking out” over the fact that Ashley Eckstein will be at GeekGirlCon. Obviously everyone knows that she’s changed the landscape for fashionable female fans, but her influence stretches far beyond that. Her character Ahsoka Tano on The Clone Wars has broken down barriers in the fandom and created opportunities for fanboys and fangirls to come together. While in some part that’s due to the great creative staff on the show, none of that would have been possible without Ashley’s grace and the heroine she’s channeled from the inside. She makes people believe in what she’s doing, and that makes Ashley a great role model for all types of fans. Earlier this year I was on a popular podcast discussing an episode of The Clone Wars and the male hosts were declaring they wanted more Ahsoka on the show. My 6-year-old nephew recently told me he wants to be like Ahsoka when he grows up. Most people don’t have any idea how unimaginable that would have been just five years ago. Will see you there at your presentation. Will hold tongue as much as possible. Getting excited to attend!